In Northern Ireland brown soda bread is known as wheaten bread, in the south, soda bread tends to be made with white flour. Irish flour is very soft and is difficult for baking yeast-leavened bread, hence the development of a bread using baking soda. which is called bicarbonate of soda in Ireland. Soda bread would traditionally be baked on a hot cast-iron griddle over an open peat fire. The griddled soda bread would be cooked into a round with an indentation marking the quarters; each quarter when broken off, hot and warm is called a farl. Today, the bread is baked in the oven with consistent results, a light hand is still important, though. 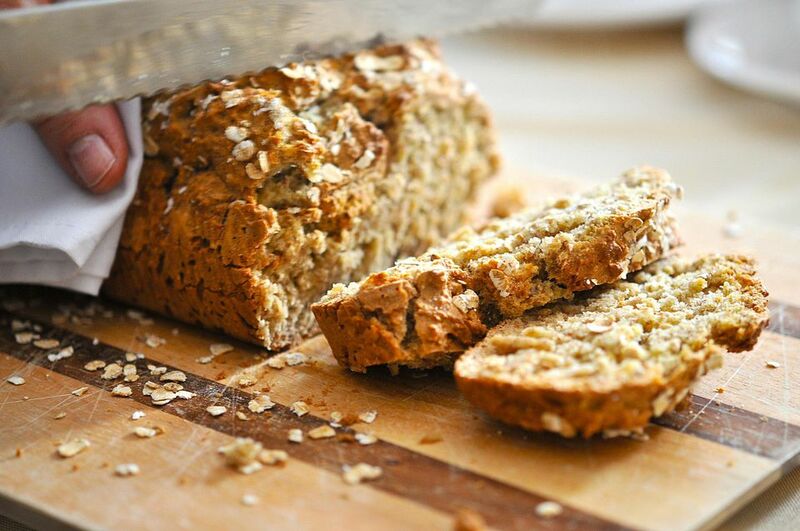 While many recipes for brown soda bread include a couple of teaspoons of sugar and tablespoons of butter, this recipe keeps it as simple as possible. When using baking soda, a recipe must include an acidic element for the soda to release gas and allow the bread to rise. In soda bread, that is provided by the buttermilk. You can't substitute regular milk as it isn't acidic enough and the soda won't release gas. In a large bowl, mix together the flour, salt, and baking soda. Add the buttermilk and stir to form a loose dough. Lightly dust the work surface with flour and turn out the dough. Knead the dough gently until smooth. Shape the dough into a ball and flatten to roughly 2 inches (5 centimeters) thick. Using a sharp knife, lightly slash the surface of the dough in the shape of a cross. Place the dough on a greased, baking sheet and bake in the oven for 30 to 35 minutes until well risen and a light brown color. Remove the loaf from the oven and allow it to cool on a wire rack for at least 30 minutes before slicing. Enjoy thick slices with butter. Make a ploughman's lunch by serving soda bread on a platter with cheese, fruit, and slices of cured meat. Soda bread is also perfect for an afternoon tea. In Ireland, the measurements in recipes are given in grams and milliliters. It is best to weigh your flour as there can be a variance in volume (as measured in cups) and weight. Many kitchen scales, even in the U.S., will give you the weight in grams as well as ounces. In this recipe, 500 grams of flour would be 1 pound, 2 ounces. To make a vegan soda bread, you can substitute a nondairy milk but you need to include an acid, such as lemon juice, to activate the soda. For this recipe, mix 1 3/4 cup nut milk with 1/2 cup of lemon juice. Allow it to sit for 15 minutes before adding it to the recipe in place of the buttermilk.